POSTED: Wed, 04/20/2016 - 19:00 | POSTED BY: Traci C.
We have more exciting news coming out of the 'Awaken Summer' press event at Walt Disney World, including information on the opening of Frozen Ever After, Soarin' Around the World, and an update on Toy Story Land. Frozen Ever After will open in June in Epcot's Norway pavilion. This new attraction takes guests on a boat tour through the kingdom of Arendelle to the 'Winter in Summer' Celebration hosted by Queen Elsa. The boats will travel through Troll Valley to the North Mountain, and into the Bay of Arendelle. The voice talent from Frozen returned to record new dialogue and songs written by Bobby and Kristen Anderson-Lopez. Also at Epcot, Soarin' Around the World is set to open on June 17, just one day after the attraction debuts at Shanghai Disneyland as Soarin' Over the Horizon. This updated attraction takes guests over The Great Wall of China, around the Matterhorn in Switzerland, and over Sydney Harbour. FastPass+ reservations for Soarin' Around the World will be available starting April 21. And while Toy Story Land won't be opening for a while at Disney's Hollywood Studios, we do have some information about two of the land's attractions. 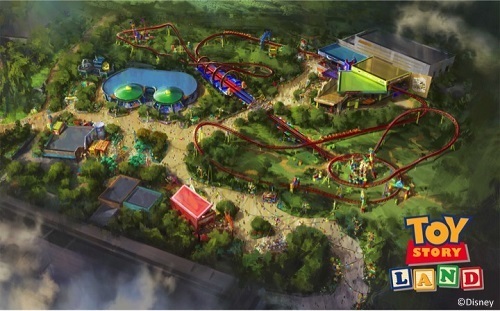 Guests will feel as though they've been shrunk to the size of toys when they visit Toy Story Land and they'll have a chance to enjoy Slinky Dog Dash, a family coaster that Andy has built in his backyard using his Mega Coaster Play Kit. The second new attraction is the Alien Swirling Saucers that was designed by Andy using a toy set he got at Pizza Planet. Just watch out for The Claw. Other news from the Studios: the third track of Toy Story Midway Mania is scheduled to open on Memorial Day Weekend. And finally, guests will have a chance to enjoy the all-new Mickey's Royal Friendship Faire at the Magic Kingdom when the show debuts in June. What new or updated attraction are you most excited about? Let us know in the comments.